Part of Section 4 : Plate 80. Height District Map Section No. 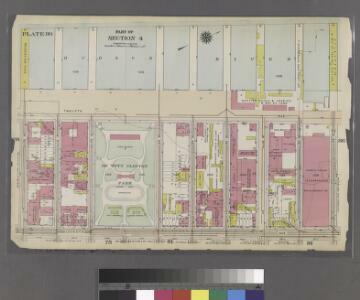 5; Height district map / City of New York, Board of Estimate and Apportionment. 8A - N.Y. City (Aerial Set). From Atlas 116.1. Vol. 5, 1911. From Atlas 117. Vol. 6, 1892.
from Area district map / City of New York, Board of Estimate and Apportionment. from Use district map / City of New York, Board of Estimate and Apportionment. from First and second wards: Long Island City and Newtown. Map of Brookland Ferry. Extracted from: Stiles, Henry Reed. A History of the city of brooklyn. V.1. [Map of wharves and piers on North River from Battery Place to Hammond Street] / Edwin Smith, city surveyor, New York, November 1850. Bergen County, V. 1, Double Page Plate No. 1 [Map bounded by Edge Water Rd., Hudson River, Hudson County Blvd.] / by George W. and Walter S. Bromley. 1 : 9600 Hopkins, G.M. 5D - N.Y. City (Aerial Set). Description: from Atlas of the borough of Manhattan, city of New York.